Holiday Gift Guide: Le Mieux Skin Perfecter and TGF-B Booster + Giveaway! Get the perks of professional facials at the convenience of home with the Skin Perfecter! This year’s perfect beauty gift is a 4-in-1 At-Home Tool that improves skin appearance, brightness, radiance, skin texture & smoothness. Give the perks of professional facials at the convenience of home with the Skin Perfecter! This non-invasive beauty tool combines four skin treatments into one tool to deep cleanse, exfoliate, extract, and infuse serums and other topical treatments for smoother, brighter, perfect-looking skin. It never requires any replacement brush, cartridge, or disc. Professional-strength ultrasonic waves gently and visibly improve lines and wrinkles, pores, texture, clarity, and smoothness after every treatment. In clinical studies performed over a period of only two weeks, 100% of participants showed an immediate improvement in skin exfoliation, while 84% of participants saw improvement in overall skin appearance, 80% of participants saw immediate improvement in brightness, 69% of participants saw an immediate improvement in radiance, luminosity and healthier-looking skin, 65% of participants saw an improvement in the appearance of skin texture and smoothness, and 50% of participants saw an improvement in appearance of fine lines and wrinkles. Resonating at an amazing 28,000 vibrations per second, the Skin Perfecter gently glides over wet skin, producing ultrasonic waves that pulverize water, creating micronized particles that deep cleanse pores of excess oil and impurities, exfoliate cellular debris, extractimperfections, reduce the appearance of enlarged pores, and resurface lines and wrinkles. As an added benefit, its pulsating ultrasonic waves accelerate the absorption of serums and other skincare products, which is confirmed by the clinical study, producing far more effective results than massaging products into the skin by hand. To perform effective deep cleansing, extraction and exfoliation, Luu recommends holding the unit with the tip of the spatula angled down. “Keep the skin wet, and always move the Skin Perfecter outward and upward,” she advises. To infuse serums or skincare treatments, apply product to the face and neck. Hold the unit with the tip of the spatula flat against the skin. Gently glide the spatula outward and upward over the face and neck. After the treatment, turn off the unit, clean the spatula with an alcohol-saturated cotton pad, and store in a cool, dry place. The Skin Perfecter features an easy-to-hold ergonomic design, 4 levels of intensity, a battery indicator that lights up when the device is charged, a rechargeable battery that allows more than 2 hours of operation, an automatic alarm and shut off after 10 minutes, and a DC power supply adapter. The device measures 6.85 x 2.05 x 0.75 inches (174 x 52 x 19mm) and weighs 3.88 ounces without the adapter (.11 kg). 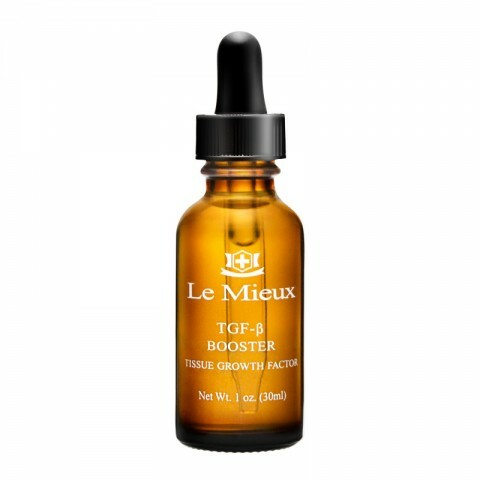 Another great gift idea is the TGF-B Booster also from Le Mieux. This silky, hydrating serum with 4 potent peptides, 5 revolutionary proteins, powerful antioxidants, and algae extracts improves the appearance of facial contours, reduces the appearance of fine lines and wrinkles, and restores a healthy glow. Boosts results when used with other skincare products. Features Superoxide Dismutase for extreme antioxidant benefits. Reader Giveaway: One lucky Jinxy Beauty reader will win a bottle of TGF-Booster (ARV $65)! To enter, just complete the entry form below by 11:59pm ET on 12/28/15. Good luck! This entry was posted in Giveaway, Skin Care on December 5, 2015 by Ashley. I learned that Micro-massage action provides 28,000 ultrasonic vibrations per second. I learned the Skin Perfector “1. Cleanser–deep cleanses skin and pores of excess oil, makeup residue, and surface impurities. 2. Exfoliator–gently removes cellular buildup using non-abrasive micro-exfoliation. 3. Extractor–extracts imperfections and reduces the appearance of enlarged pores. 4. 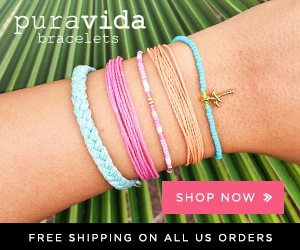 Infuser–accelerates absorption of serums and other skincare treatments.”. I learned that it is the perfect beauty tool for all ages and all skin types. I learned their Skin Perfecter never requires brushes, cartridges, or discs. I like that it’s on sale for $189. I like that the Skin Perfecter addresses so many skin issues! It seems like a great all around tool. I learned that skin perfector uses vibration to revitalize the skin. Thank you, Chrysa! Cheers to PERFECT skin. Happy Holidays! 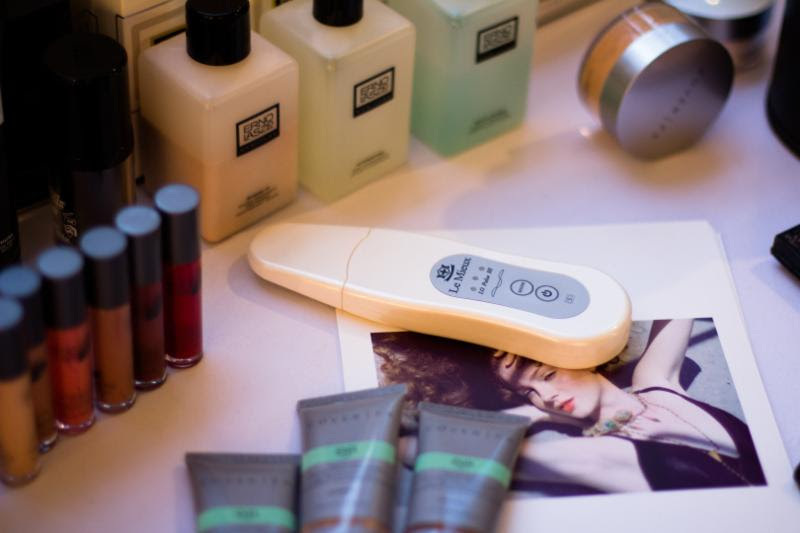 I learned that the Skin Perfecter transcends ordinary cleansing by combining four skin-perfecting treatments into one ultrasonic, handheld beauty tool. I love that it doesn’t take a lot of time! 3 minutes 3 times a week! WOW! I am really impressed! I am sure this would help my acne prone skin! It only is used 3 times a week for 3 minutes which is perfect for my busy life! I love that it’s gentle enough to use every day!!! I liked that the Skin Perfecter only has to be used 3 times a week for 3 minutes. Its perfect for busy women like myself. I like the Skin Perfecter. I learned that the Skin Perfecter never requires brushes, cartridges, or discs. I learned that The Skin Perfecter uses low frequency ultasonic waves to gently cleanse my skin. I like the micro massage action. Learned that it only takes 3 minutes, 3 times a week. Three easy steps too! I love that any skincare product that is not oil-based will provide better results with the Skin Perfecter!! This technology is just so new an different!